Hello 🙂 I’m Ian, a native to Glanmire in Cork, Thanks for taking the time to wander through my site of all things yoga. My yoga journey started in 2011 when I was looking for something to compliment my other passion of surfing. After my very first class, I knew there was something incredibly powerful about this practice but didn’t quite understand it at the time. For the 2 years after taking my first step onto the mat I traveled throughout Australia and New Zealand practicing many forms and styles of yoga. Towards the end of my journey down under I could see how yoga was in such an incredibly positive way beginning to shape and transform my life, from my diet and lifestyle to my general outlook on life. At this point of my Journey, I knew that yoga was all I wanted to do. From Australia I made a short trip across the Indian ocean to Bali, Indonesia, here I completely submerged myself in my two passions of surfing and yoga, as my exploration of yoga deepened my thirst for knowledge and understanding of the practice grew which led me to the motherland of yoga, India. 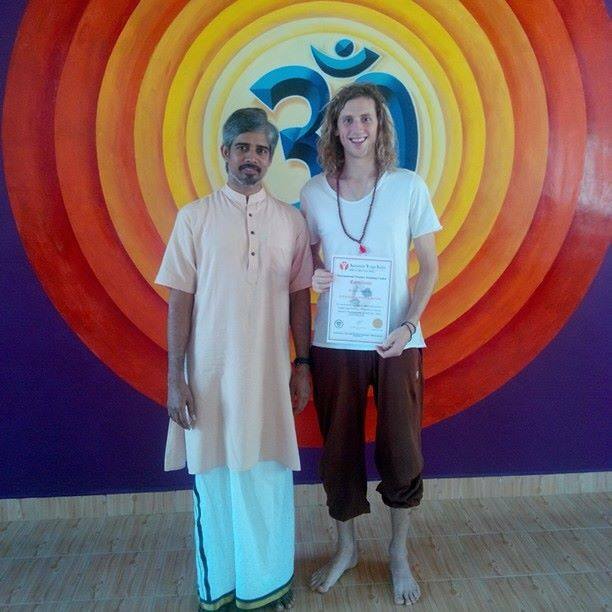 My first trip to India was in 2014, here I completed my first teacher training, a 250hr Teacher Training Course under the supreme guidance of Guruji Bharath Shetty, this was a life changing experience which only further compounded my pursuit to understand and share the practice of yoga. Following my first teacher training, I traveled throughout India and Indonesia, teaching and practicing yoga. Towards the end of 2014, I settled back into Mysore, India to undertake my advanced teacher training, once again under the guidance of Guruji Bharath Shetty, at the end of the course, I was presented with a 500hr advanced teaching certificate. I have returned to India many times since my first trip to study under Guruji Bharath Shetty, completing over a 1000hrs of study and practice. My own teaching journey has taken me through India, Indonesia, Europe and back to where it all began in Cork. Since 2014 I have established my own teaching practice Santosha Yoga Cork, teaching many many students throughout Cork City and County every week, in public class, private, retreats and in the workplace. I strongly believe to be able to share the teachings of yoga that you must practice what you preach, I have an unwavering commitment to my own self-practice and see myself as an eternal student, always looking to evolve and deepen my own practice, just as a tree never stops growing and a river never stops flowing. The style of yoga I teach I believe is open to everyone, of all ages and abilities, yoga has an endless list of benefits, with the potential to help alleviate and prevent many of life’s afflictions and ailments. I feel incredibly blessed and privileged to be able to share this practice and look forward to sharing it with you soon.